I simply cannot hold out on you any longer. 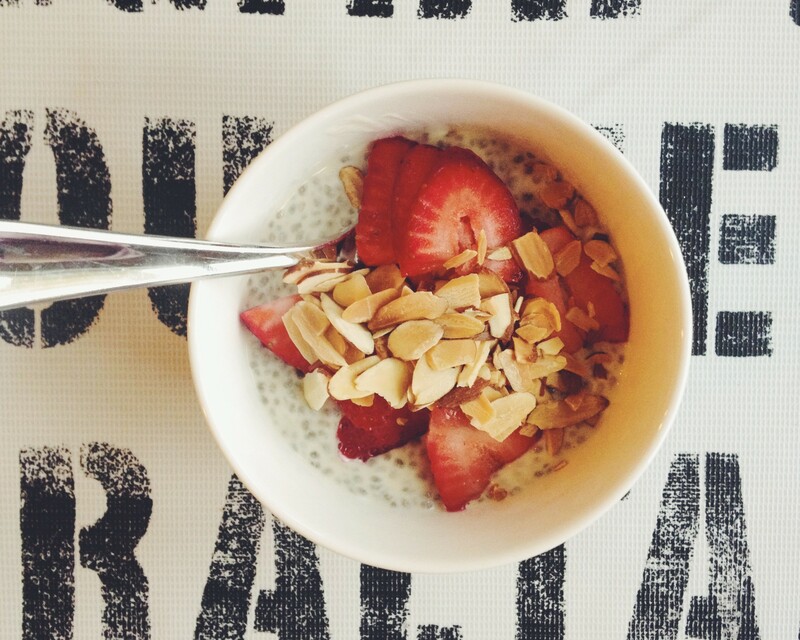 Chia seed pudding has become my new obsession. I want to eat it every single day for the rest of my life. First, let me list just some of the great health benefits of chia seeds: they are a great source of fiber, antioxidants, omega-3 fatty acids and minerals. They are gluten-free, for those of you who are mindful of that. They are super filling so you don’t fill up on other junk, help regulate the body’s insulin levels and can keep good cholesterol levels high and bad cholesterol levels low. Very important stuff. Now let me tell you how you can whip them up into something so delicious, you won’t even care that they are good for you…you will just want more. In a medium bowl, gently whisk the almond milk, yogurt, 2 tablespoons maple syrup, the vanilla and 1/8 teaspoon salt until just blended. Whisk in the chia seeds; let stand 30 minutes. Stir to distribute the seeds if they have settled. Cover and refrigerate overnight (will keep in the fridge for a few days). Serve with strawberries, almonds and another drizzle of maple syrup. Marvel at how delicious – and easy – healthy living can be! Send me a Tweet to tell me how much you love it (@wwgwynethdo)! I love Chia Pudding! I’ve actually never thought to try putting yogurt in it. I don’t do dairy, but I think coconut milk yogurt would be delicious!!! Also, you might want to check your grocery stores bulk department. I get organic chia seeds really inexpensive. I’m not sure how big the bag you buy is, but it might be even more cost effective. Just another option ; ) I’m definitely going to check out this recipe! My son loves it, but adding the yogurt in would give it another depth of flavor and would be a good breakfast option for him. Have a great weekend!!! I’m going to give this a try. I made a quinoa pudding last night and it was so gross! It may have been that I used a tablespoon of cinnamon instead of a teaspoon but I can’t imagine it ever tasting good. Looking for a healthy treat with protein and minimal dairy and this sounds just right. Hope you’re well.